A Gente Rio [The People River] (2016), is based on the Itaipu Dam, the second largest hydroelectric plant in the world, and whose process of land expropriation was a catalyst for the emergence of the Landless Workers’ Movement (MST); the Belo Monte Dam on the Xingu River, whose process of environmental licensing has been marked by a series of irregularities and profound indigenous resistance; the Bento Rodrigues Dam, which collapsed, releasing hazardous waste from the mining company Samarco and causing an unprecedented environmental disaster in Brazil; and, lastly, Vale do Ribeira, where indigenou caiçara and quilombola communities resist against the construction of a dam. 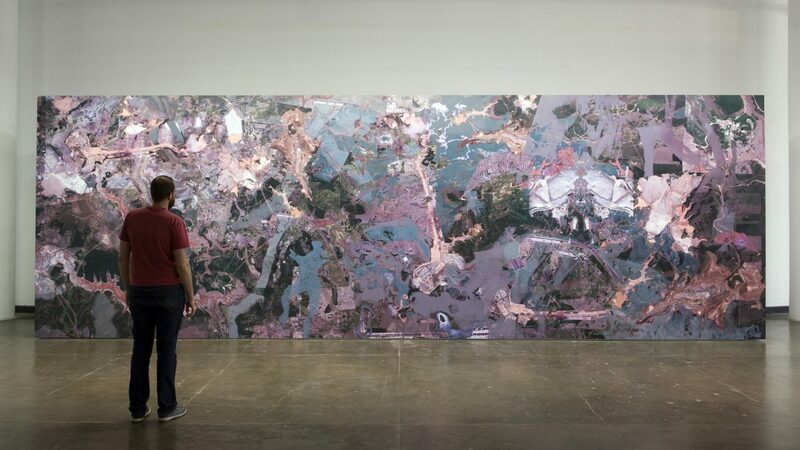 Caycedo visits these sites and, back at the exhibition, armed with satellite images, documents and drawings, discusses the monumental environmental impact that these projects have on their surroundings. The depositions, personal accounts and objects, such as fishing nets brought by the artist, point to the accumulated knowledge of the communities with which she works and which, as a collective body, are resisting the extinction imposed on them by these development-oriented projects.